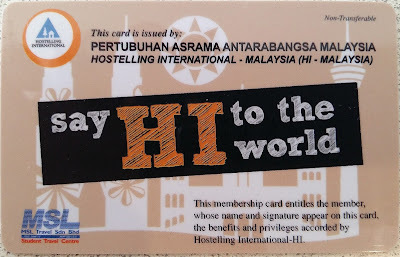 Credit cards, bank cards, insurance cards, business cards, frequent flyer card; of all these, none do I carry with more pride than my Hostelling International (HI) membership card. Seriously; "MEMBER SINCE 2000" and proud of it. My wife and I first joined HI in early-2000 by procuring one-year memberships from YHA (or "Youth Hostel Association") New Zealand to take advantage of their discounted hostel accommodation rates for our 2½-week holiday there that autumn. Until then, we'd never before stayed in hostel-type lodgings; and while not knowing what to expect, I must say we were pleasantly surprised by what we ultimately saw (and experienced). Clean accommodation, hot showers and, more importantly, safe. Yes, the rooms may be functional at best but, trust me, they were very decent and definitely excellent value for money. On our return from NZ, we decided to sign up as life members of HI-Malaysia in anticipation of our future trips abroad and, in particular, our planned trip to Australia the following year. From then on, HI hostels have become our accommodation of choice - be it in New Zealand, Australia, France, Switzerland or England. I am writing this blog post to encourage all intrepid travellers out there who've yet to join as a member of Hostelling InternationaI - whatever your age or creed and wherever you're from - to do so today. It will be one of the smartest choices you'll ever make in life and definitely one you won't regret. But what exactly is Hostelling International? Well, HI is essentially a non-profit organisation where membership gives you more than a comfortable bed after a long day of sightseeing and exploration. It literally puts you at the heart of a huge international family where you can share travel experiences and friendship with people of all nations. 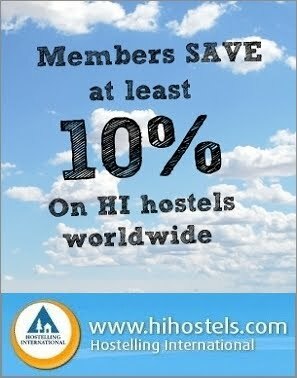 Your HI membership card not only opens doors to the world's largest network of safe, clean and welcoming hostels but also (in the case of many hostels around the world) a discount of at least 10% off your accommodation - just one of the many reasons to become a member. Apart from value-for-money accommodation in more than 4,000 hostels worldwide, HI membership also offers you access to thousands of travel-related deals such as concessions on admission to attractions and museums as well as discounts on meals, transportation and even sightseeing tours. So what's in it for you by enrolling as a member of Hostelling International? Well, plenty. In fact, here are 10 reasons why you shouldn't wait a minute longer. Whatever your budget, HI membership helps you to explore and literally say "HI" to the world - whether you're backpacking across Croatia, exploring the Pacific coast from Sacramento to Seattle, hotting up the tango scene in Buenos Aires or just chillaxing on an idyllic beach in Goa. So, what are you waiting for? Join the Hostelling International family today by clicking on this link: Hostelling International - Apply here to discover the real hostel experience OR if you hail from Malaysia: HI Malaysia membership application. 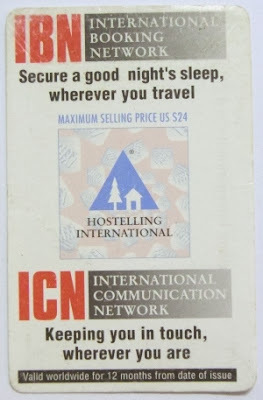 I hope to welcome you as part of the Hostelling International community soon. Before I wrap up, allow me to leave you with a collage of pictures of HI hostels from around the world. I trust you'll be impressed by what you're about to see. Disclaimer: This blog post is neither an advertorial for nor a representation of any third party brand names contained herein. I do not/did not draw any benefit - commercial or otherwise - out of this. Are you a member of HI? If so, please share with us briefly your experiences as an HI member. If not, do you plan to join HI after reading this? Very informative. The hostels look really nice too! Thank you, Kay Dee. I hope budget travellers (like me) will find this useful. Good things are meant to be shared, no? I didnt know about this! Im going to register!!! Btw hv u been to europe during winter? Hi, Sylvia. Yes you must join HI. It only costs RM300 for a LIFE membership with HI Malaysia. As for Europe, I always choose to visit in spring. Next time, it'll probably be in autumn...... but no, not winter. Too cold and wet. Hope you're having a great time over there. I am in the same track who always spent nights at hostel. 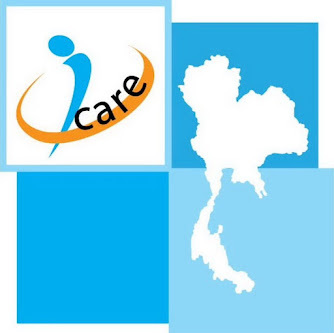 I am the member of HI as well that is very useful for the budget traveler like me who is poor but love to explore. I am heading to Australia (Darwin and Tassie). Of course the hostel is my destination. I like your writing which is pretty much positive and more open for everybody shares their thoughts. I wish you luck on your travels, Kathy. You'll love Australia. Thank you for your kind words about my writing. Thank you. 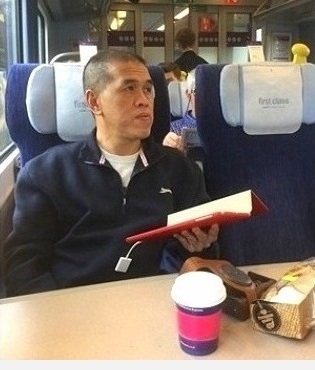 I hope so to enjoy the trip. Very excited to kangaroos country. Just a little bit worry with language barrier. I am not used to with Australians. It's big adventure. Microsopft 70-483 Customer satisfaction is the first priority of the Dumps4u and 100% money back guarantee, if you are fail and not satisfied our offer 70-483 exam. Good to know about that as they are giving quite luxurious lifestyle to the ones whom lived in that hostel.